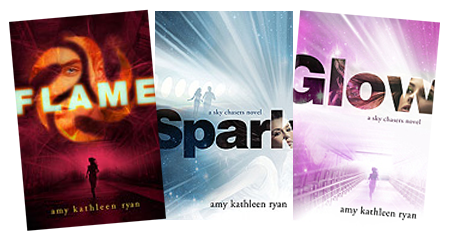 Check out the Sky Chasers trilogy: FLAME, SPARK and GLOW. What if you were bound for a new world, about to pledge your life to someone you'd been promised to since birth, and one unexpected violent attack made survivalnot lovethe issue? "Ryan has created a fascinating and thrilling story that is sure to captivate teens. The themes of survival, morality, religion, and power are well developed, and the characters are equally complex. 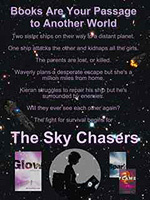 The author has also created a unique and vivid outer-space setting that is exciting and easy to imagine. This gripping first installment is difficult to put down, and successfully sets the stage for the rest of the series." "Utterly engrossing. Dinner went uncooked, children were left to fend for themselves, and dog howled all night, because I COULD NOT PUT IT DOWN." These posters, signed by the author, are free for librarians, teachers, and booksellers to hang where potential readers will see them. Please click the poster you'd like to request and in the email include your name, title, and work address, and the poster will ship to you within two weeks. Posters will not be shipped to private residences. Site design © & maintenance by xuni.com. All content © 2008-2019, Amy Kathleen Ryan.